While doing tourism, I use the Wikimedia Commons app to send pictures of monuments to Commons (a repository of free media). Most minor monuments are not on Commons, but the Eiffel Tower has already 1000s of pictures, and my smartphone's camera is not going to produce a better one. So, I would like to check what pictures of the area are already on Commons. FYI: Example of a picture with geolocation attributes on Commons. Is there an app or website that shows Wikimedia Commons pictures on a map? I am NOT talking about Wikipedia articles. I am talking about Wikimedia Commons pictures. 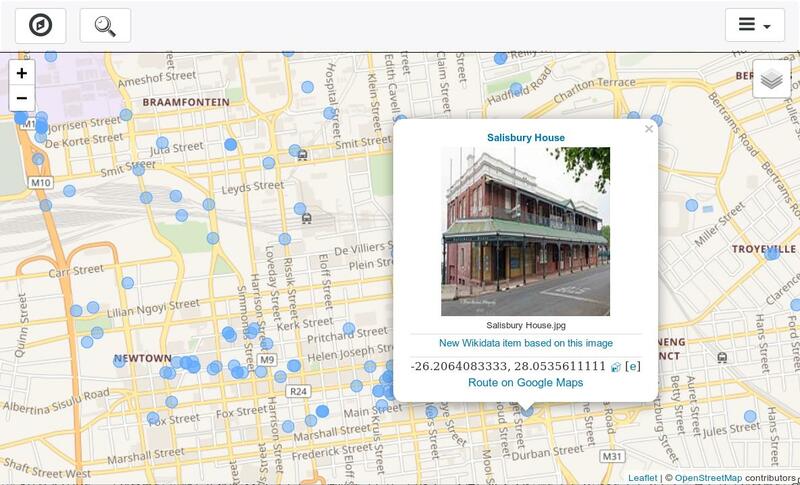 Show all pictures that have geolocation attributes on Commons. Preferably thumbnails on a map, but a list sorted by proximity is OK too. Center to my current position. Search a location. For instance searching for "Leesburg" will center the map on Leesburg. In addition to pictures that have geolocation attributes, also show pictures that have no such attributes but have a geographical category, for instance pictures in the category [[VillageTownA]] should be shown at the location of VillageTownA if they have no individual geolocation. Sensible zoom, depending on the number of nearby pictures. Zoom should not be the same in the middle of the Sahara desert and in Manhattan. Click on thumbnail to view picture full-screen. An acceptable solution could be to transform the coordinates of all Commons pictures (SQL file, 200MB) to .osm with each point having an URL to the image. http://wma.wmflabs.org/ is a map with all Commons pictures. For zoom levels with too many pictures, only the best pictures are shown. Problem: Very difficult to find the place you want, because there is no search, no way to enter a latitude/longitude, and city names are not displayed. GeoCommons is a project to show geocoded images from Wikimedia Commons in Google Earth. You can take the KML file, and use it on Android with a KML-compatible navigation app. Using it in OsmAnd would probably require first transforming to .osm then .obf. I cannot guarantee that it is working all night and day, but at least sometimes. WikiShootMe is currently the most modern tool for this. In the upper-right, click the Layers button and deselect all but "Commons images". Not the answer you're looking for? Browse other questions tagged android images maps mediawiki or ask your own question.